The Royal and Ancient Burgh of Linlithgow has plenty of places to visit. It still retains an old town character as you walk along the High Street. From the 18th century coaching inn, The Star & Garter (rebuilt after a fire in 2010), you can take a pleasant stroll past 17th century and Victorian buildings, home to lots of independent shops, cafes and hostelries, where you will receive a warm welcome. After all our town motto is “St Michael is kinde to straingers”. In the centre of the High Street you will arrive at the town Cross and Burgh Halls. You can then proceed up the hill to Linlithgow Palace or continue along to the West Port of the town. To enjoy the walk at its best you can download the linlithgow-heritage-trail-visitor-guide or pick up a printed copy at The Burgh Halls.Behind the High Street you will find the Linlithgow Canal Centre on the Union Canal. Just across the road are the beautifully laid out Learmonth Gardens and Ross Doocot. Enjoy a walk or cycle along the canal towpath. 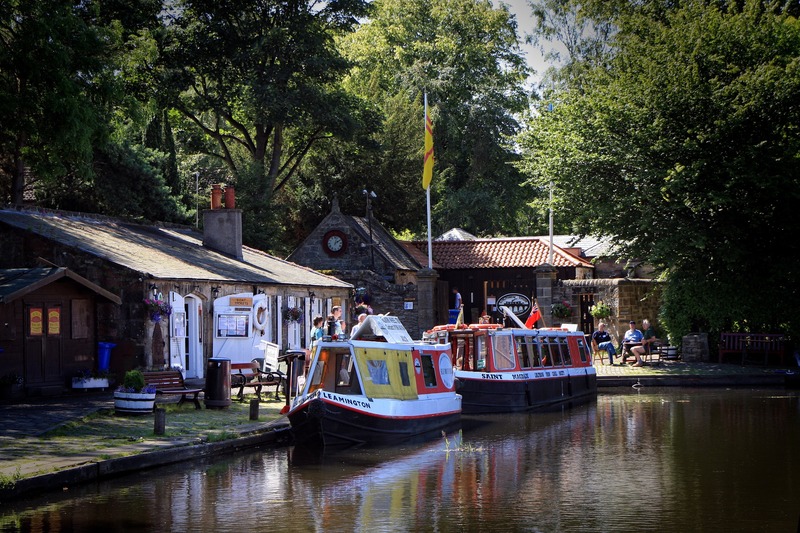 Alternatively take one of the regular boat rides, run by the Linlithgow Union Canal Society. For further details see below. On the other side of the High Street, the town is bordered by Linlithgow Loch and Peel (historic Royal park). A pleasant walk round the loch will take around an hour. This takes you through a wildlife sanctuary and you will enjoy stunning views of Linlithgow Palace. You can also fish on the loch. There’s always things to see and do in Linlithgow. Special events take place at The Palace during the year: In July there is Jousting on The Peel and on 5 Wednesdays throughout the Summer you can join Scotch Hop ceilidh dancing in the courtyard of the Palace one of the most stunning locations you are likely to find. Around Halloween, brave souls can join ghost walks around the town. 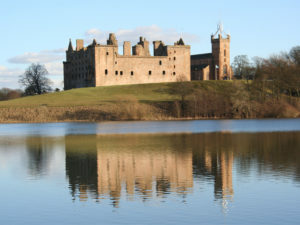 Linlithgow Palace is also a favourite movie and TV location. In the TV series Outlander it is part of Wentworth Prison. In The Outlaw King, the courtyard stood in for Perth castle and the grounds and backdrop over the loch were used for the crowning ceremony of Robert the Bruce. Standing beside Linlithgow Palace, and where Mary, Queen of Scots was baptised, this stunning medieval church has been tastefully restored over the years. It is one of the largest Parish churches still active today. The modern aluminium spire on the Church was added in 1964. It replaced the old stone crown removed in 1821, for safety reasons. This was a striking and controversial addition to an historic building. 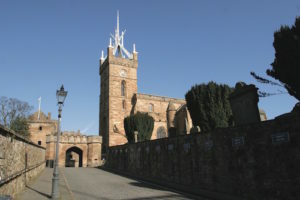 The Church was also recently used as a filming location for the movie The Outlaw King, It featured in the wedding of Robert The Bruce and the funeral scene of his father. 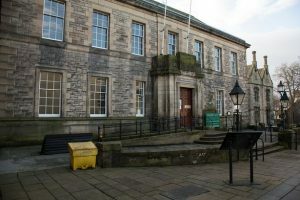 The Linlithgow Museum is a volunteer run community museum due to re-open in April 2019 that will tell the story of the town. The Museum is run by Linlithgow Heritage Trust which is a registered charity. It will feature three new galleries and a bespoke Community Space in which we will run events including school and reminiscence sessions.. Together these will provide a fresh interpretation of the town’s history and showcase the Trust’s rich collection of objects, photographs, and archive material The Mary, Queen of Scots statue from Annett House garden has been restored and will form the centrepiece of Gallery One. At the centre of the Royal Burgh is the Cross and Cross Well. 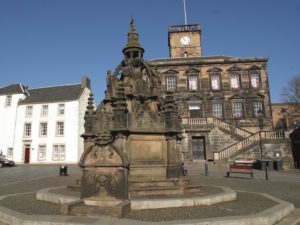 It was once the location of the town’s Mercat Cross – the hub of the weekly market and location for public ceremonies and announcements. Overlooked by the traditional 17th century Burgh Halls, this is still the heart of the local community where civic events such as Linlithgow Marches take place. Robert Gray, a one-armed stonemason constructed the current Cross Well in 1807, This was built as a replacement for an earlier well daring from 1628. It was restored again in 2016, with new lighting, and it now flows once again. The Kirkgate leads you from the Cross up to the Palace. Look at the wall on your right as you walk up to see series of plaques which plaques which record the line of succession from Mary, Queen of Scots to Elizabeth II. You will go past the Burgh Halls, up to St Michael’s Parish Church and into Linlithgow Palace with its surrounding park or “Peel”. Take a short walk up from the High Street under the bridge, past the railway station and you will arrive at the Union Canal. The Edinburgh and Glasgow Union Canal was opened in 1822 and ran for 31½ miles from Edinburgh to Falkirk. It was joined by a series of eleven locks to the Forth and Clyde Canal. The canal was divided into four stages and had milestones every half mile, some of which still remain. Today, the Canal Basin is home to the Linlithgow Union Canal Society (LUCS). 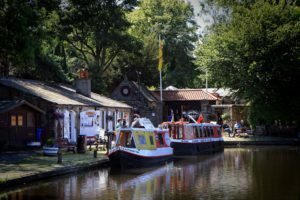 Here you can experience a bye-gone age of transport where LUCS operates boat trips, Scotland’s only Canal Museum and a Tea Room. Whilst there stop to admire the bronze statue of Dudley the cat. This was installed by another local group Burgh Beautiful in memory of one of their founding members. The Linlithgow Canal Centre is open each afternoon from Easter to the October break. 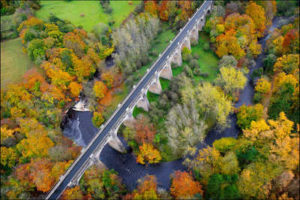 If you do take a boat trip you will go across the second largest aqueduct in the UK. The Avon Aqueduct is 810 feet long and sits 86 feet high above the river Avon. If you can make some time to get into Linlithgow Bridge and take some great photos of the Aqueduct from below. Across from the Canal Basin you can relax among the beautiful flower beds of Learmonth Gardens, also home to the Ross Doocot built in the 16th century. This contained 370 next boxes but is now inaccessible. Beecraigs Country Park is a great place to visit. It caters for a wide range of leisure and recreational activities within its 370 hectares (913 acres). 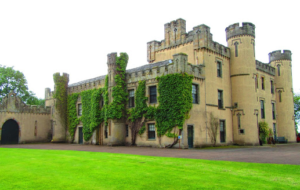 It is nestled high in the Bathgate Hills near the historic town of Linlithgow. Beecraigs is open throughout the year and admission is free. The Park offers miles of crisscrossing woodland paths and trails to explore. They also offer excellent access to main attractions such as the adventure play area, the animal attraction, and the Visitor Centre. If you are feeling fit then take a walk up Cockleroi (from the Gaelic Cochull Ruadh meaning Red-capped Hill). This hill overlooking Linlithgow has some fantastic views of Linlithgow Palace and Loch. 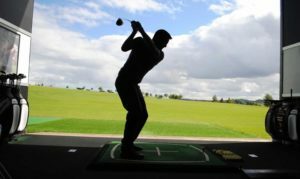 Open throughout the year the Kingsfield golf centre is located on the eastern fringe of the town, accessed from the Blackness Road just before the M9 motorway junction. Newly refurbished and extended, this 4 Star Visit Scotland location offers the full Golfing Experience. This includes a full size 9 hole USGA Specification Golf Course and Golf Driving Range with indoor and outdoor tees. There are also Golf Tuition Studios, Short Game Practice area, the Ochils Family 18 Hole Putting Green plus the Tea Caddies Coffee Shop. The House of the Binns stands as a living monument to one of Scotland’s oldest families, the Dalyells. Thomas Dalyell, an Edinburgh merchant made his fortune at the court of King James VI and I in London. He built the current house in 1612. Thomas’s son, General Tam Dalyell, formed the legendary regiment of Royal Scots Greys. Set in beautifully landscaped parkland this fascinating house by Linlithgow has been the home of the Dalyells for over 400 years. The National Trust for Scotland manage the house, its contents and the grounds. The Estate is open all year around, with the house open June to September. Bo’ness and Kinneil Railway – The Railway Man, Outlander, Cloud Atlas, Agatha Christie’s Ordeal by Innocence, to name just a few. You can visit all of these sites independently, but if you would like a guided tour, including behind the scenes chat, you can contact Linlithgow tour company Mary’s Meanders, who specialise in Filming, Outlander and Mary, Queen of Scots tours. During the course of the year you can come and join us in a number of events. Please check our Events Diary for a full schedule. Please take a look at our What’s on Events Calendar for full details of what’s happening when you are visiting but here’s a flavour of some of the larger events in the local calendar. Linlithgow & Linlithgow Bridge Childrens’ Gala Day: on the Saturday following the Marches. Linlithgow Folk Festival held annually in September. Scotch Hop: Ceilidh dancing in Linlithgow Palace, Wednesday evenings for 5 weeks in summer. The Further From Festival: Linlithgow’s very own book festival held in January.